Okay before we get into the actual memes I have a few points to make. I have never made a meme before – I have enjoyed these forms of art since elementary school, but never actually wondered how to make one. This lack of knowledge on meme creation will definitely “shine through” in these memes. The memes will be bad, but from what I learned, a bad meme = a funny meme? I hope you enjoy them nonetheless. This is probably the best project ever? Think about it. What other class allows you to make memes about the material you are learning? I would have never thought the day would come when the whole class spends their time making memes. This is great. Thank you for this opportunity. Okay, so now for the memes! When we first looked at some memes in class, I immediately thought “Lemongrab” (hence the pun in the title). For those who don’t know, lemongrab is a character from the television show “Adventure Time”. He is a minor character that only appears a few times in the series, yet he is also my favourite. You can see why in this video. He has so many great facial expressions and “emotional” scenes, making him great “meme material”. One of Lemongrab’s most iconic moments is when he yells “this castle is in an unacceptable condition!”. When I heard this I immediately thought of Trump. I made this meme from the perspective of non trump supporters views on Trump. 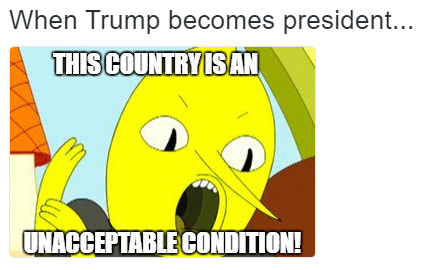 Many non-Trump supporters believe that if Trump becomes president than the country will well, be in an unacceptable condition. This meme shows the influence of the american revolution on the French revolution. The American revolution had just happened, and France is having ideas about having their own and overthrowing the king. Even though France may have had ideas about a revolution, the American revolution greatly inspired those and made France realize “well if they can do it, we can do it too!”. This meme connects to the big idea about emerging ideas and ideologies. The American revolution was and idea that sparked ideas in France and eventually had an influence on the French revolution. I made this meme to represent the relationship that Hamilton and Angelica had. 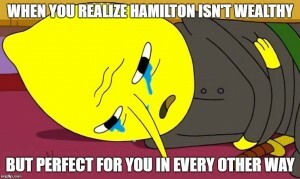 Angelica and Hamilton were physically and mentally attracted to each other, yet could not be together due to the difference in classes. In Angelica’s eyes, her job was to marry rich, which would not have been fulfilled if she were to marry Hamilton. This is explained from the song “satisfied” from the musical. Hamilton eventually marries Angelica’s younger sister Eliza, whom he is also in love with. This situation and meme is a good example of class differences and how that effected people’s life. A big idea that I think relates to this well is the disparities in power alter the balance of relationships one. In those days, for the most part wealth=power. Since Angelica was a higher class, she wanted to marry rich to continue to have that “power” in her family. This meme represents the election that took place. President John Adams was out of the running leaving Jefferson and Burr in a tie. Hamilton has to side with one of them and eventually chooses Jefferson. This is shown when Hamilton states “but when all is said and all is done Jefferson has beliefs. Burr has none “From the song “Election of 1800” in the musical. 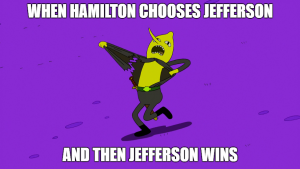 After Hamilton chooses Jefferson, he wins by a landslide which infuriates Burr. This causes Burr to then challenge Hamilton to a duel. This meme is supposed to represent the anger Burr had that was caused by Jefferson winning. 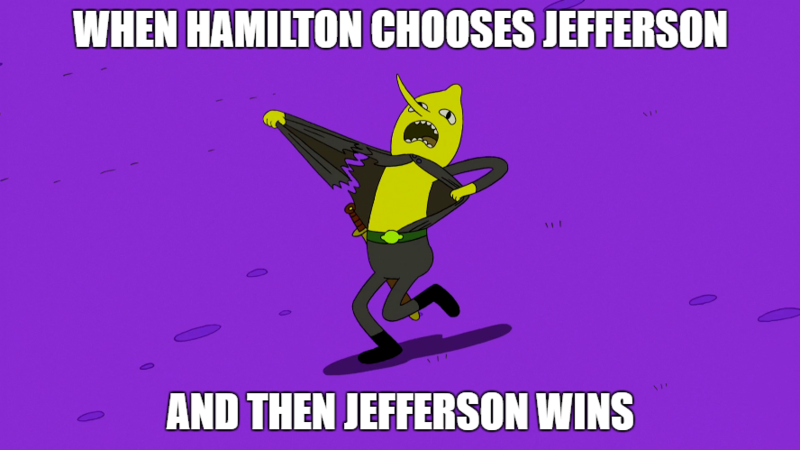 Lemon grab ripping off his clothes represents how Burr was ready to duel Hamilton. Well, that’s the end of this very special blog post. I hope you learned a few things (I sure did haha). 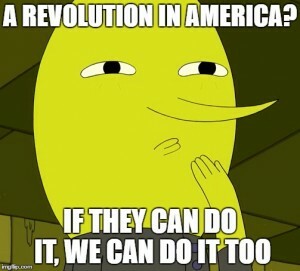 I had a lot of fun during this whole procces (listening to hamilton, looking and pictures of lemongrab, laughing at myself) and hope to maybe make some more memes one day!